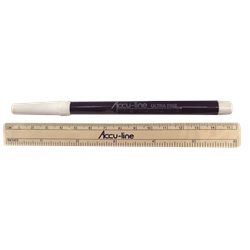 Ultra-fine tip marker tip with 6cm trim ruler body and 6" accessory ruler, no clip. Markers are single-use and sterile with gentian violet ink. Manufactured by Accu-Line. Comes 10 per box.